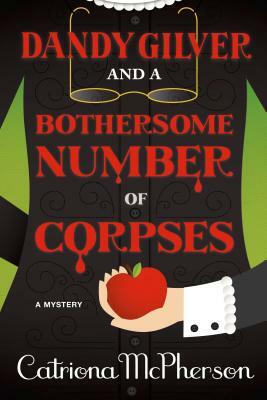 CATRIONA MCPHERSON’s Breakable Rules on Making Crime Pay + GIVEAWAY of A BOTHERSOME NUMBER OF CORPSES! We’re excited to have Catriona McPherson with us today on The Debutante Ball. If you’ve met Catriona, you know she’s a delightful person. If you’ve read her books, then you know she’s also a talented writer. Before she was a detective, before she was a reluctant wife and distracted mother, before she was even a debutante, Dandy Gilver spent one perfect Edwardian summer with the Lipscott girls and their mama. The golden memories have never left her. So when two of the Lipscott sisters beg her to help the third she can hardly refuse. Fleur Lipscott is buried alive in the tiny seaside village of Portpatrick, working as a schoolmistress. But she’s one of the few remaining, for St Columba’s has been shedding mistresses as a snake its skins—and the exodus is far from over. With mistresses vanishing and corpses mounting up, can Dandy maintain her disguise long enough to stop the one and solve the other? Catriona has offered to send a copy of Dandy Gilver and a Bothersome Number of Corpses to one lucky commenter; details are at the end of this post. When Lori told me she was looking for five pieces of advice from veteran writers to post on a blog called Debutante’s Ball, I thought “And . . . I’m one of the lucky debs who gets to choose a veteran?” Because I might have eleven books out there, with Nos. 12 and 13 at the publishers, No. 14 in progress, and No. 15 already whispering to me (I counted it up while dragging the wheeliebins down the drive last night), but this writing life still feels like a strange new world. That being said, if I hide behind my fan and try to make out I have trouble sharing opinions, you’d hear many hoots of derisive laughter from people who’ve…you know…met me. So here goes. Ignore everything I’m about to say. Except not really. But here’s what I mean. There are as many flavors of advice as there are writers and some writers can be quite persuasive. Pen or PC? Annie Proulx says, “Writing on a computer leads to facile thinking.” Get her. Plot it or pants it? My friend Aline Templeteon says of plotting, “I like a well-made book.” Hard to argue when you put it like that. Prologue? The vitriol meted out to the humble prologue is hilariously over the top. It’s like the one-space two-space war (which in turn is like the plain- and star-bellied sneetches). So all of my advice comes with a side of this: If you’ve thought these things but successful writers you admire have derided them, you are not alone, and feel free to quote me. If any of my advice strikes you as complete garbage, toss it. Wearing my skull-and-crossbones rah-rah skirt* and waving my pom-poms, here I go to cheer my genre. You’ll never be on Fresh Air, you’ll never win a Pulitzer, you’ll never be asked by the New York Review of Books what you’ll be reading this summer and have to pretend that it’s mostly political memoirs, but if you choose to write genre fiction and further choose to write mystery, suspense, or thriller, the gods will smile on you. First of all, it’s fun! Absorbing, challenging, rewarding fun. Something’s always at stake in a crime novel. The gloves are off, the pulse is pumping, and the ending matters. Now, I enjoy a lyrical exploration of loss and longing as much as anyone, but murder never hurts. And then there’s grubby commerce. A bookseller once told me after a couple of drinks that they could keep the front tables and the mystery shelves, ditch everything else and feel no pain. Mystery readers read. A lot. If you’re writing to reach readers, write crime. They’ll break into your house and read the drafts straight off your laptop. And they’re a great bunch. The stories of those hard-bitten romance writers and readers are legendary—blood in their hair, hate in their hearts—but the crime community is made of fluffy bunnies dressed in human suits. Humanoid, anyway. *I’ve really got one. I do know I’m forty-eight; I just don’t care. First I write the story and make up everything I don’t know. But I write down everything I’ve made up. When I’m finished and the draft is settling, I go and check out everything I’ve written down. The second draft is pretty much the result of adding the research reality check to the first-draft flight of fancy. But here’s the thing: I only change what’s impossible. If it can’t happen, I chuck it. If it might happen, at a stretch, once in a million years, I keep it. So the story is only lightly tethered to expectations and floats pretty free. I’m sure that if I researched in advance, I’d end up with what’s typical, even stereotypical—it would constrain the story before it had even begun. Warning: This method is not quick and involves a lot of weeping. Don’t wash the baby ’til it’s born. Related to point 3, I suppose, is the fact that I don’t edit as I go. I don’t even read what I’ve written. That first draft comes out ugly and stays ugly until it’s all the way out. Stephen King (again, I know) talks about chipping a story out of the ground without breaking bits off before trying to polish it. There are various advantages to doing it this way. Some of them are obvious—you get to the end, you don’t waste time fiddling with material you end up not keeping—some less so. Like this one: If you don’t read as you go, some of the first draft will feel entirely new when you do read it, and so you’ll be better placed to be an objective editor. Or to put it another way: It won’t feel like your darlings you’re killing. Also, in my experience it’s easy to get sick of something you’ve written. (I only know it’s time to send the umpteenth draft off to my agent when I’m so disenchanted that I can hardly bear to look at it, when I can only read it if I say “bleh ble-bleh, ble-blergh” under my breath, and when my response to any problem is “Cut! Cut the page! Cut the chapter!”) If you’re sick of twenty pages because you’ve edited them to death, there’s a danger they’ll end up in a drawer. If you’re sick of three hundred and twenty pages…much less likely. Sort of related to the idea that you don’t research until you’ve pounded out 100K words and you don’t admire your work as you go is the notion that the only thing that counts as writing, for a writer, is making your story longer (first draft), better (second and subsequent), perfect (copy-editing and proofing), or the first of a series (writing a sequel). Here’s some stuff that’s not writing: research, blogging, commenting on blogs, updating Facebook, cross-posting on Twitter, going to conventions, talking to your editor, talking to your agent, talking to other writers, producing website copy, researching web managers, writing blurbs, writing proposals, writing synopses, going to creative writing workshops, giving creative writing workshops, reading books about writing, attending launch parties, hosting launch parties, holding up your new book jacket wrapped round a book of the right size and smiling at yourself in the mirror. I do all of them. And a writer could quite easily spend a forty-hour work week doing nothing else. But they’re not writing. Do you like breaking writing rules? Which do you break? Which of Catriona’s awesome breakable rules resonates the most with you? GIVEAWAY! Comment on this post by noon EST on Friday, November 22nd, and you’ll be entered to win a copy of Dandy Gilver and a Bothersome Number of Corpses. Follow The Debutante Ball on Facebook and Twitter for extra entries—just mention that you did so in your comments. We’ll choose and contact the winner on Friday. Good luck! Catriona McPherson is the author of DANDY GILVER AND A BOTHERSOME NUMBER OF CORPSES (Minotaur), the latest in the Agatha, Lefty, and Macavity Award-winning series set in Scotland in the 1920s. Last year she began a strand of modern stand-alones with AS SHE LEFT IT (Midnight Ink). The second, THE DAY SHE DIED, is out in June. 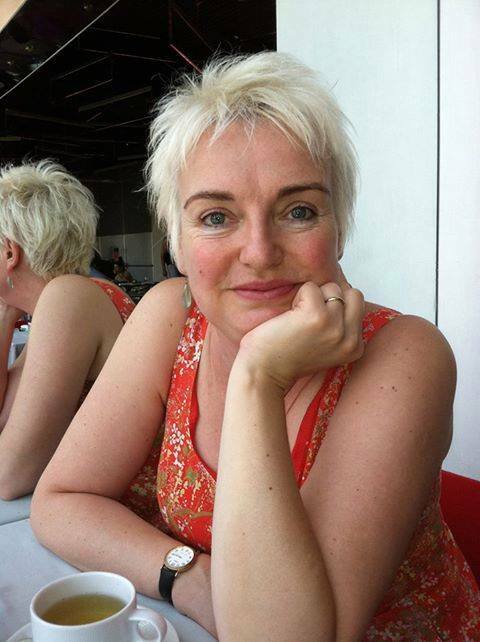 Catriona is the vice-president of Sisters in Crime and blogs with Femmes Fatales and Criminal Minds. Find her on Facebook, Twitter and at www.catrionamcpherson.com. If you’re a stalker, find her in northern California, where she lives with two black cats and a scientist. “Write first, research later.” Such great advice, and something I’m testing out with my current draft. I love to research, so I often fall prey to the Google rabbit hole. Now I just use brackets to indicate where I need to insert research in my draft, so I can keep the story moving. Hey Catriona! Nice seeing you here bright and early on a Saturday morning! I subscribe to the research later motto too. I like your reasoning about not constraining ourselves in the first draft. In truth, I’m just too chaotic to research first off — how do I know what to research? I’m not much of an outliner either. I’m with you, Catriona. I think I break every one of those “rules,” especially the research one. Great post! Love this post, Catriona! Crime *does* pay. Just back from the launch of the Sacramento SinC anthology – Capitol Crimes – and yes, indeed, mystery writers are a fine bunch. Susan, I’m going to sit on your shoulder and whisper in your ear to try to lead you further astray: don’t leave a blank – make stuff up! I loved this Article. I do every bit of this. I research later and I write without reading it until the edits. I would adore to win this Book..
Marilyn (ewatvess@yahoo.com) I have tweeted this Giveaway and I follow on Facebook and Twitter The Debutante Ball. Your post was enlightening. So many other distractions which prevent productive work. Your advice is excellent. Thanks. I’m quickly becoming a rule-breaker and I like it. i am interested in the catriona mcpherson book and it has lots of poetry and plot and them a semi-aquotion and it interest the reader and it has a lot of movie actions. I usually agree with write first, edit later, except with Chasing the Sun, I got stuck halfway through plot-wise, and researching the time period and things that happened in that place and time really helped me push forward in ways that wouldn’t have occurred to me had I not done the research. “Only writing is writing” is GENIUS. It’s post-it note, stick it on my laptop worthy. Thanks so much for visiting us, Catriona!